Have Questions About Our Products or Our Company? A lot of people do. Here are some of the more common ones that people ask. Just click on the question to reveal the answer. Where’s the price for the custom tile murals? Follow the numbered steps to choose a Custom Tile Mural size. After you have made a selection, the price will appear below the bottom left corner of the art. Can I provide you with an image to make a mural or decorative tile? Yes you can. You can provide your own image in the form of a photograph on photographic paper, postcard, poster (please ship flat with rigid side protection, or e-mail us a scanned image (300 ppi @ 8×10 inches). There is no additional charge for this service. Can you change the colors of the images in your galleries? No. ALL the images we represent are licensed to us either by that artist directly or through their respective agents. The only alteration allowed is in regard to cropping their images in order that they fit on certain size tiles. 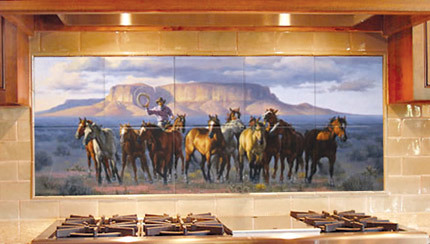 Can you manufacture murals in custom sizes? Yes we can. If you are interested in an image from our collection in a custom size, please email us at sizeinfo@txlccustomtilemurals.com or phone us toll free at 1-800-524-5909 and we will be pleased to provide you with pricing immediately. If you would like to see your own image in a custom size, please contact us at info@txlccustomtilemurals.com with your specifications and we will email your image as an attachment. Can I see what a mural would look like in my custom size? Yes we can depending upon the restrictions of your email client and/or server allocations. Viewing the mural image is another consideration. Even an image of a mural that is 5×5 ft will not fit on your screen and will use a lot of RAM from your computer, you may or may not be able to view it. Do you ship murals assembled? Yes, murals can be backed and fully assembled before we ship them. This does incur an additional charge for the cost of the backer. The odd size can also lead to additional shipping fees, as our shipper charges based not only on weight, but also on dimensions. Murals can also be ordered with black metal frames. This may take longer as each frame must be matched to the specific mural. This will also incur an additional charge for the cost of the frame. Remember, once tile has been backed and framed it should only be used as a wall mural, as trying to remove tiles from the backer usually results in damage. Do you recommend applying grout after a mural is installed? This would depend on your own preference. If you are applying the grout to our tumbled tile, we suggest that you first cover the mural with masking tape before applying the grout. Some stone and porcelain tiles are variable in texture and may have natural holes on the tile surface. Since these characteristics are part of the tile’s aesthetic pleasure, filling those holes with grout may have an undesirable effect. If you are installing a mural in a kitchen backsplash, shower, or Jacuzzi surround and do not want to use grout, we suggest using clear silicone between the tiles. If you do wish to use grout use ONLY Non-sanded grout. All of our murals are shipped with a complete installation guide that contains full instructions and a list of acceptable materials to be used. Additionally, a layout grid is supplied for the installer showing each tile (numbered on the back with T-top, R-Row, C-Column), and supplied for the client in the event that any of the tiles suffer breakage during installation. Tiles broken during installation are not the responsibility of TXLC to replace. Can your products be installed in a wet location like a shower? Yes. All of our products are water resistant and have been successfully installed in kitchen backsplashes, behind bars (private & commercial), shower/Jacuzzi surrounds, etc. When properly grouted they will not come loose and the color will not suffer any degradation due to common non-abrasive household cleaners. Can your products be installed in a floor? We recommend our tempered glass tile for floor applications. The glass tile we use is non-skid and 90% harder then ceramic tile. The image is printed on the underside of the glass tile and is therefore damage resistant. Once a floor mural is installed the image can only be damaged by physically breaking out the glass tile. Call or email us with your requirements. Do you seal your murals and decorative tiles? All of our products are completely sealed and protected from water and non-abrasive household cleaning agents. The sealer will last throughout the lifetime of the product. We will not accept an order for a mural that is to be installed for an outside installation that will be in direct sunlight. Because of our own testing in the Arizona sun where the UVA and UVB rays are one of the strongest on the planet, we do not feel comfortable with exterior installation in direct sunlight. On the other hand, we have tested murals in kitchen backsplash, shower/Jacuzzi, floors, bars, kitchen islands, etc. where installations took place over 6 years ago and the murals look today just as they did when installed. What’s the best way to clean and maintain the ceramic and glass tiles? TXLC Tile guarantees that all tiles and tile products will arrive without being broken. Should your order arrive damaged and the damage is a result of the shipping company, TXLC Tile will replace the tiles and/or tile products at no charge to the customer. What kind of return policy do you offer? TXLC Tile does not accept returns, as each piece is produced when ordered, making it entirely custom to the needs of the customer. Feel free to send us an email at info@txlccustomtilemurals.com or call us toll-free at 1-800-524-5909. We are happy to provide you with the answers you seek.